Normandy makes for a great holiday. It’s not too far away, the weather is not too hot and there is loads to do and see. Our highlights of Normandy blog takes you through the best things to do on your holiday to Normandy. Most of us automatically think of flying to our destination when we’re planning a holiday – but have you ever thought of taking the ferry instead? The UK is just a few hours of sailing time away from our east coast, but for something a little more different, you can also sail directly to France from Rosslare and Cork. Irish Ferries connects Rosslare with Cherbourg in Normandy and Roscoff in Brittany, while Brittany Ferries sails to Roscoff from Cork. Both Normandy and Brittany are beautiful regions to visit, rich in character and history. 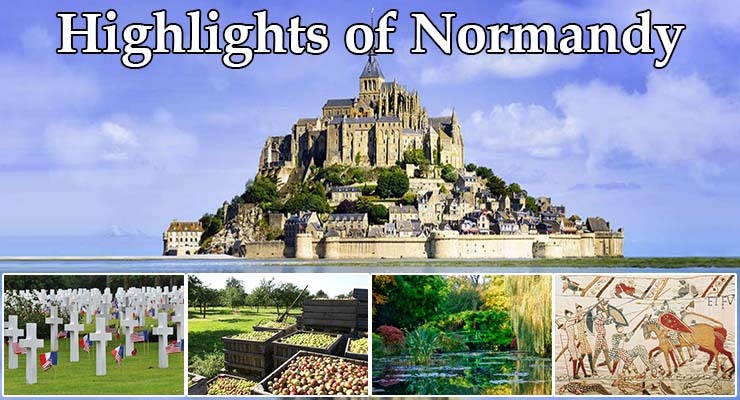 You can of course tour both on the same trip to France, but here, we’re going to focus just on highlights of Normandy. We’ve got a separate post on Highlights of Brittany. The medieval Mont Saint-Michel is one of the most iconic images of France. The village and monastery is built on a rocky outcrop in the middle of a tidal flat and connected to the mainland by a causeway, which floods over each evening. Pay attention to the signs telling you what time to leave by, or else you’ll be there for the night! A solemn air hangs over these locations, and it’s impossible not to be overwhelmed by thoughts of the thousands who lost their lives during the fighting of World War II. The American and British cemeteries have grand monuments to their fallen soldiers. The German cemetery is much more understated. A guided tour of the beaches and cemeteries is highly recommended. It’s most famous for the 230-foot long tapestry telling the story of the Norman invasion of England in 1066, and the tapestry itself is well worth seeing. But Bayeux also has much more to offer. It survived World War II relatively intact, and features many narrow streets crammed with centuries-old wooden-framed houses, as well as a Gothic cathedral. It’s a great place to spend a few hours wandering around. You can literally spend hours wandering the stunningly-beautiful gardens that surround what was the home of painter Claude Monet for most of his days. See the water lilies that inspired his most famous work, and also take a peek inside the house to see how he lived. A visit here is truly memorable. Whisper it, especially if you have children with you…but if you make it as far as Monet’s Garden, you’re only about 90 minutes drive from Disneyland Paris. You might just want to consider it! And if you’re going there, check out our top ten tips for Disneyland Paris. We also cater for all age groups with our Travel Insurance policies specifically tailored for the over 65’s, 70’s and 75’s available to buy online.